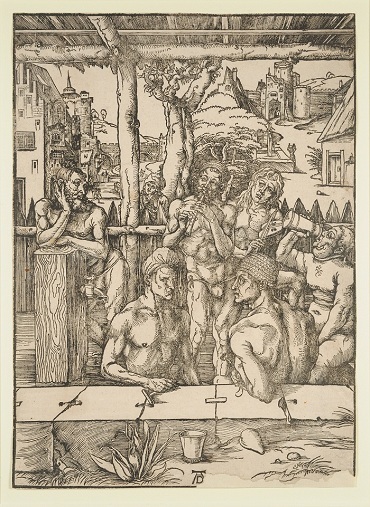 Dürer depicts an open-air bath house of a kind that was popular in northern Europe around 1500. 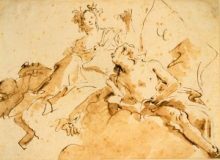 Male figures are shown at different ages and in varied and complex poses, created by a network of crisp lines that curve and trace the surface of the bodies, with subtle variations in thickness. The unusual outdoor context allowed the artist to render 3-dimensional depth with a landscape background, revealing his incredible ability in the challenging medium of woodcut. Dürer saw the great potential of prints for the transmission of his original designs and these were widely circulated during his lifetime.